Neil Phillips, chair of the RTM Ordinance Committee, marks up an amendment proposing the trapping and removal of coyotes at the June 26 meeting. Editor’s note: The original version of this article mistakenly wrote Neil Phillips was the Democratic candidate for Westport-Weston probate judge in the special election for that position in 2013. In fact, Phillips was among four candidates seeking the endorsement of the Democratic Town Committee for probate judge, but Kiernan Costello, not Phillips, won the party’s endorsement. 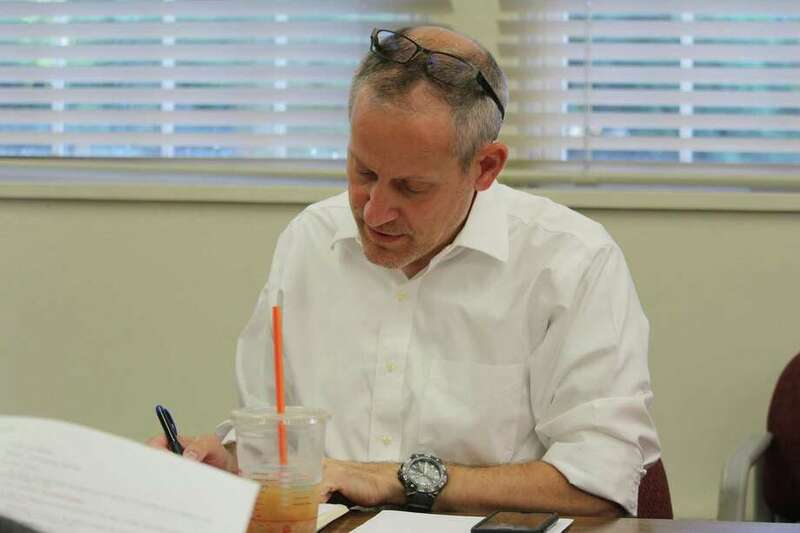 WESTPORT — Local lawyer, parent and Representative Town Meeting member Neil Phillips is set to join the Westport Board of Education. Phillips’ appointment fills the vacancy left by former board chairman Michael Gordon, who resigned in June citing an increasingly busy schedule. First Selectman Jim Marpe swore in Phillips after the Board of Education unanimously voted to appoint him to the open position in Town Hall on Aug. 7. Because Gordon is a Democrat, the Democratic Town Committee was charged with vetting candidates for the open seat. Smith, a Republican, said the BOE has the final vote on who to appoint, but the fact Phillips was endorsed by the DTC carried weight in the board’s decision. “We certainly had other candidates who would have been well-qualified, but the consensus was Neil had such great hands-on experience being a member of the RTM education committee, and currently its chair,” DTC Chairwoman Ellen Lautenberg said, noting the DTC nominating committee received applications from seven people for the position. Phillips showed a clear understanding of the issues facing the BOE, namely the education budget, school security and employee contracts, Lautenberg said. A trust and estates attorney and partner with the local law firm Lennon Murphy & Phillips, Phillips has lived in Westport for over 25 years and has cousins who have been in town even longer. He was born and raised in Manhattan and earned a bachelor’s degree from Muhlenberg College, a law degree from Syracuse University, and a master’s in labor relations from the University of New Haven. Phillips’ first foray into Westport politics came in 2013, when he sought the Democratic Town Committee’s endorsement in a special election for Westport-Weston probate judge. The past probate judge had been ill for a number of years and had essentially vacated the position, and Phillips felt he wanted to step up and use his expertise in trust and estates law to help get the Probate Court back up to speed, he said. Phillips did not win the party’s endorsement and Republican Lisa Wexler won the position, but after the election, Phillips said people asked if he would run for the RTM. So he did, and has served on the body for five years, currently as member of the RTM’s Ordinance and Planning And Zoning committees and chairman of the Education Committee. His involvement with the school budget on the RTM has brought him in close contact with the BOE, Board of Finance and selectman’s office and given him a greater appreciation for the issues facing each group, Phillips said. “I enjoy the budget because it gets all the town bodies to work together and come up with an appropriate budget for the town,” Phillips said. In addition to the budget, he said he is concerned with cyberbullying and cyber issues and hopes to address the topic as a member of the BOE. “Social media has definitely created a different set of circumstances parents have to address,” said Phillip, who lives in town with his wife, Kim, and twin sons Nathaniel and Dylan, who will enter sixth grade at Coleytown Middle School in the fall. RTM Moderator Velma Heller said the group will miss Phillips when he resigns from the RTM. “He’s a very intelligent and just a very sane person. He’s a good person that I think people on the RTM admire, and I know he’ll be a valued member of the Board of Education as well because he’s so capable, not just because of his intellect and expertise as a lawyer, but because he’s a clear thinker and just a good person,” Heller said.